Pine Forest was founded by Hughie Black, a teacher and professional basketball player. His team the Philadelphia SPHAS (South Philadelphia Hebrew Athletic Society) was the beginning of the Philadelphia Warriors (now the Golden State Warriors) and the Philadelphia 76ers. Hughie and his team are celebrated in the basketball Hall of Fame in Springfield, Massachusetts. Established in 1931, Pine Forest was started in 1931 and is still owned and operated by its original family on the same land, making it one of the oldest camps under continuous ownership in America. Pine Forest is located in the middle of 1,000 acres of woodlands but is only an hour and half away from NYC. 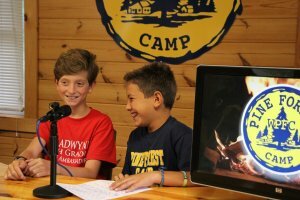 Campers come from 404 towns, 11 states and 6 countries. The return rate of eligible campers is 98% and there are almost 100 new campers every summer, taking the place of those who “graduate”. In partnership with Rustic Pathways our 11thgraders do community service, working with underprivileged children in Costa Rica. The ratio of staff to campers is 1 staff member for every 2 campers. An “Old-timers” Tree stands in the middle of camp with the names of those campers and counselors who have attended Pine Forest for at least 10 years. There are over 400 names on the tree. Today we packed up, have our awards ceremonies, and tonight it’s the candlelight. It feels like we just arrived. But we’re coming home with so much more than we can pack in a bag; new friends, new adventures, new confidence. There isn’t a duffle bag or shipping company big enough to handle it. Those are the things that we carry. 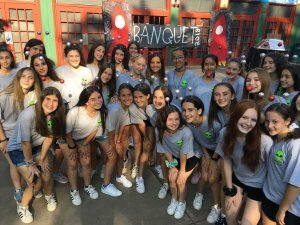 Our Senior girls were knee deep in Banquet preparations this week — all for tonight! This year’s theme? 8-er Space! The dining hall was transformed into another world and the food was AWESOME. 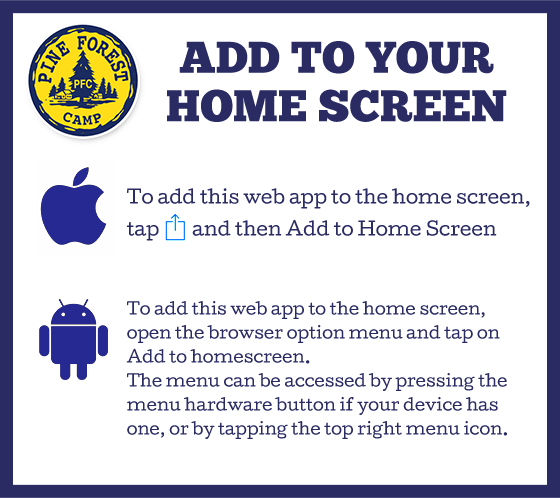 Home from Camp: Warnings + Tips! The transition to “the real world” isn’t always easy for you and your campers. Here are some tips to help both of you make the transition as smooth as possible. Yes, they’ll be SO happy to see you. They’re also very, very sad. They’re sad to leave camp! They’re sad to leave their friends! They’re sad to leave their counselors! They’re sad to leave their independence and camp persona! It’s okay (great actually)! It means you gave them the best gift ever! 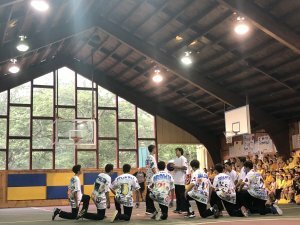 In the last week alone, they experience Color Days, the play, song and cheer, a gymnastics show, banquet, packing and more. Over the past seven weeks they’ve been living with ten other people, hanging out with friends day and night, participating in activities from sun up to sun down. Enough said. It might take a few hours or a few days to be entirely “on.” They might even seem a little numb. It doesn’t mean they don’t love you or didn’t miss you. It doesn’t mean that they won’t open up and start gushing in a few days. Nothing is wrong. They just need time! 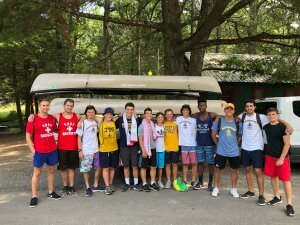 Things that are normal: wanting to talk to their camp friends immediately, all-day, every day for a few days (yes, they just spent seven weeks with them – we know). Wanting to spend some time alone before jumping into the deep end of home life (think family gatherings, sporting events, play dates). Any combination of the above. Normal. Normal. Normal. Focus on small moments and questions. Think about your two best friends who live far away. Friend one: you pick up the phone no matter what, even if you only have a minute. Though it’s been months, you know she’ll cut right to the chase and start where things left off. Or not. Maybe you just answer a quick question, maybe you talk about who got the final rose- you can hang up when you need to. One word answers, longer answers, anything goes. No pressure. Friend two: You love her. Really. You LOVE her as much as friend one. But you really only pick up when you have time to sit, totally focused, for an hour-long catch-up. So, no. You don’t always pick up. 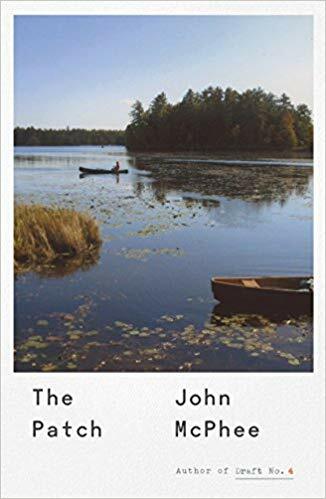 Because you’re at work, or you’re making dinner, or you’re about to get the kids ready for bed, or you just don’t feel like telling your life story. That. Sounds. Exhausting. The moral? Be friend one. You’ll learn more! What was this morning like? Which activity was the best? Who was the goofiest counselor in your bunk? Tell me EVERYTHING about camp. Can you explain your weekly schedule? What were all of your counselors like? Ask a few, manageable, lighthearted questions every hour on that first day. You’ll open up that can of worms without having to pry, without overwhelming your fresh-off-the-bus camper. At camp they were the most independent versions of themselves and they’re still basking in the glow of those camp freedoms. Advocating for themselves, making independent choices— it’s why you sent them to camp! Think about how you felt the first time you came home from college. It was a little weird! Think about small liberties you can introduce to reinforce your camper’s summer growth. If you have an eight-year-old who didn’t make his or her bed before camp, encourage him or her to make the bed at home (even if it isn’t as beautiful as you’d like). Though seemingly a “chore,” having your camper do things for him or herself at home will continue the summer’s momentum and make him or her feel happy and confident. And isn’t that what this whole camp thing was about from the start? that you are moving by fast and moving with the force of one of the great rivers in North America. You’re on the Delaware. Some campers crave the unknown, the unexpected… true adventure. And they love a canoe trip. Put on your sunscreen, your life jacket and grab a paddle. You never know what’s around the next bend. Kind of like life. Camp is many things, but there’s nothing fake or virtual about it. It is as real as real can get. Once you commit, you may get wet, you may get weary, but you’re going to make it. And there’s no better feeling. Our campers that have been at Pine Forest for 3+ years celebrated being OLD TIMERS with an ice cream party and a special gift this afternoon! Best Boys’ A Game Ever?! Double overtime, blue team winds by in a thrilling buzzer beater! COLOR DAYS 2018 HAS BEGUN! This year it’s Awesome 80’s Blue vs. Super 70’s Gold! What was the surprise, or “break”, to start it all? A birthday celebration for Marvin Black in the Dining Hall. 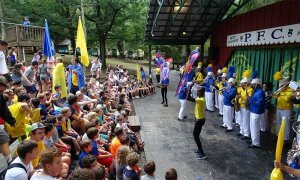 The famous Patriot Marching Band and the world-renowned Bushwacker Color Guard burst through the doors and led the campers to Netsy Playhouse for a 1980’s vs. 1970’s BATTLE OF THE BANDS! Here’s a link to follow the ACTION!